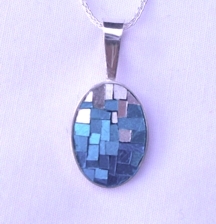 Creating a gradient is another successful design that I use in these pendants. This one isn't quite as good as some others I've done, owing to the drastic contrast between the silver and the turquoises, as well as the small base area. Having said that, I do still like the result, it just wasn't quite what I had hoped for.